A Little Recorder Music (Eine Kleine Blockflötenmusik) - Here's a new arrangement of the best known movement from Mozart's Eine Kleine Nachtmusik. 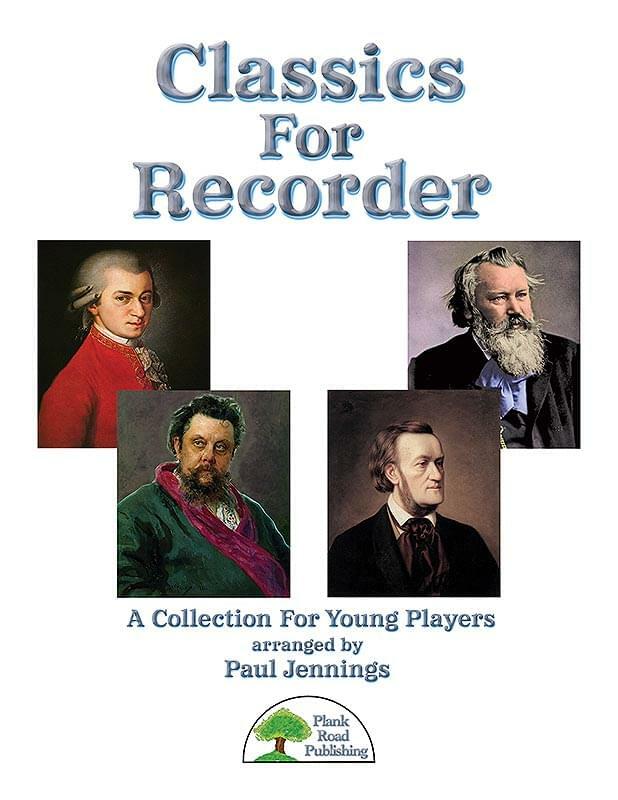 For more flexibility so your players grow as they perform it, we recorded six versions of the work, and have provided two different recorder parts. Recorder A uses the notes G, A, B, C, and D. Recorder B is closer to the original melody and uses D, E, F#, G, A, B, C, high D, and high E.
Chester (A Revolutionary War Fantasy) - William Billings was one of America's first well-known composers. "Chester" is probably his best-known work, ranking just after "Yankee Doodle" in popularity. The first soprano part requires the full C scale. The second soprano part requires only G, A, B, and C, and the optional alto recorder part is ideal for students just learning to play. Finale Maestoso (from Academic Festival Overture) - Paul has adapted the finale of Johannes Brahms' Academic Festival Overture for your recorder players. There are two recorder parts: Recorder A requires the notes G, A, B, C, D, and E, and more technical ability, but is quite playable; Recorder B is simpler, using only the notes G, A, B, C, and D.
Renaissance Dance (Ronde) - Tielman Susato was perhaps the best known Flemish Renaissance composer. He is probably most remembered for his instrumental music, and this melody is one of his best-known. There are two different recorder parts: Recorder A uses the notes D, E, F#, G, A, B, C, high D, and high E; and Recorder B is an easier part of mainly quarter and half notes using low E, G, A, B, and C.
Bridal Chorus (from Lohengrin) - Richard Wagner's well-known theme from his German opera Lohengrin may be better recognized by your students as the wedding theme. This is a great way to play Wagner's music and open the door for a lesson on his life and work. Arranged for three recorders and orchestra: Soprano 1 (DEF#GABCD'E') stays closest to the original melody; Soprano 2 (GABC) is easier in notes and rhythms used; and the optional alto part (GBCC#DEG') is fairly simple and accessible to most players. A Night On Bald Mountain - Mussorgsky gave us a great tune appropriate for autumn and the bewitching holiday we associate with it. There is an easy recorder part using notes B and A, and a harder part using D, E, A, B, C, high D, and high E. There's also an optional alto part using the notes A, C, D, E, and F. The accompaniment tracks provide a version with scary sound effects and one without.